Manila, Philippines, July 28, 2013 – Elite runners Eric Panique and Luisa Raterta blew the competition away at the 42K division race of the 37th National MILO Marathon Manila qualifying leg Sunday at the SM Mall of Asia Grounds, Pasay City. A record-shattering 42,214 runners joined the country’s premier footrace, marking the largest number of participants in a single race in the history of the MILO Marathon. 28-year old Panique settled the score towards the finish line and clocked in at a swift 2:30:20.51, beating Condura Skyway Marathon 2013 Filipino champion Irineo Raquin (2:30:20.73) with just 22 milliseconds to spare. Last year’s MILO Marathon Manila Eliminations champion Jeson Agravante placed a distant third with a time of 2:41:55. Panique, who only started joining the National MILO Marathon in 2004, has since received numerous awards and accolades, including the 36th MILO Marathon Bacolod eliminations crown. The elite runner recounts his close call against a tough rival at the finish line. “I beat Raquin by a mere inch and I feel very fortunate to have done so. We had kept a close distance since the 25th kilometer and maintained our pace until the last second,” he said. Panique said he has yet to decide whether he will be competing at the 37th MILO Marathon National Finals or at the Southeast Asian Games in Myanmar. In the distaff side, Raterta crossed the finish line at 3:14:17, way ahead of 2012 MILO Marathon National Finals 42K women’s second runner-up Jennylyn Nobleza (3:23:27) and Geralden Sealza (3:32:40). “I’ve kept a fast pace from the first few hours until the last 10 kilometers of the track. It was a very challenging race, not only in terms of route, but also because I was running alongside some of the country’s finest runners,” said Raterta. As a mother of three, she shares that her fervor for running has kept her family close. “My husband is a former elite runner who shares the same passion for running that I have. We also try to encourage our children to be active in sports and to always be humble and level-headed.” Raterta’s daughter Leonalyn placed first in today’s 3K division race at an impressive 11:12. In the 21K race, Richard Salaño (1:14:36) and Monica Torres (1:29:57) won their respective divisions and each received a cash prize of Php 10,000, a trophy and a spot in the finale. Actress, singer and fitness advocate Angelika Dela Cruz also ran in the 21K track, while local celebrities Aubrey Miles, Troy Montero, Karylle, LJ Reyes, Carl Guevarra, Arthur Solinap and Carlo Gonzales took part in the 5K and 3K divisions earlier today. With the invaluable support of MILO Marathon runners and partners, the Help Give Shoes advocacy, a program initiated by MILO in 2010, provides pairs of running shoes to underprivileged students from public schools across the country. A total of 1,000 pairs were delivered to beneficiary schools today in Manila, bringing the total shoe count to 27,200. Manuel Quezon City Elementary School, San Diego Elementary School QC, Dagat Dagatan Elementary School Navotas, Hulo Elementary School Mandaluyong, Fourth Estate Elementary School Paranaque, North Bay Blvd. Elementary School Navotas, East Rembo Elementary School Makati, Amado Reyes Elementary School Mandaluyong, Cayetano Arellano High School and La Paz Elementary School Makati were among the advocacy’s beneficiaries. The qualifying race will commence in Iloilo on August 4, before advancing to Dumaguete (August 11), Tagbilaran (September 15), Cebu (September 22), Cagayan de Oro (September 29), Butuan (October 6), Davao (October 13), General Santos (October 20), Baguio (November 3), Dagupan (November 10), Tarlac (November 17) and Angeles (November 24). 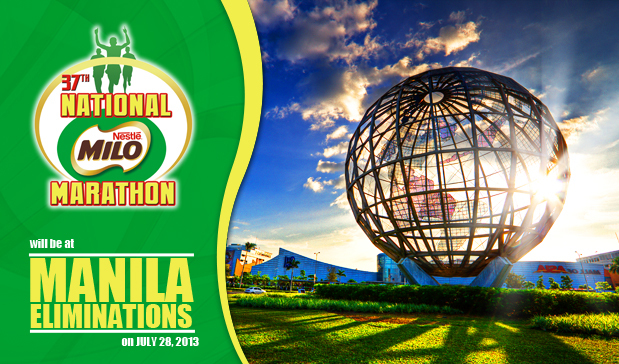 The 37th MILO Marathon National Finals will then be on December 8 at the SM Mall of Asia grounds. The 37th National MILO Marathon Manila race is made possible by Timex, the Bayview Park Hotel Manila, Reebok, SMART, Gatorade, Sennheiser, and SM Mall of Asia, along with endorsements from the Department of Education, Philippine Sports Commission and the Philippine Olympic Committee. 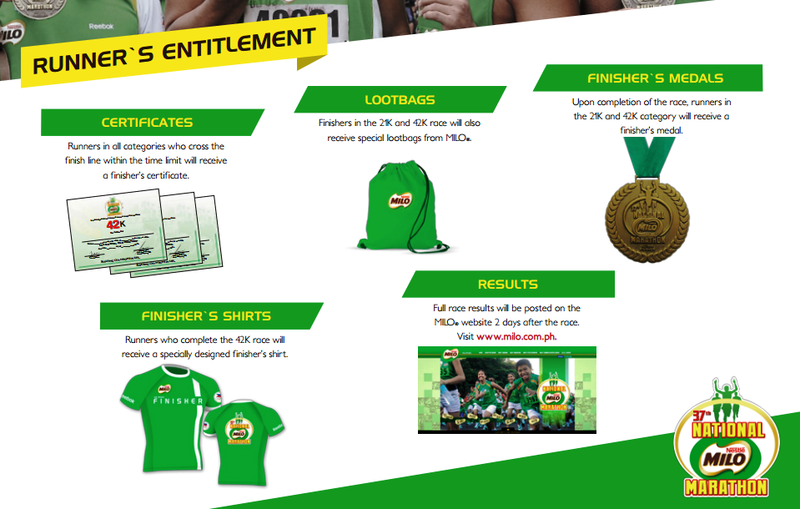 For more information on the race and its advocacy, visit the MILO marathon website or access the MILO Philippines fanpage on Facebook. Follow MILO on Twitter (@MILOPH). Students should present a valid ID in order to avail of the Php75 registration fee. Participants must be 18 years and above on race day to be able to register and participate in the 42.195km and 21km race categories. a. 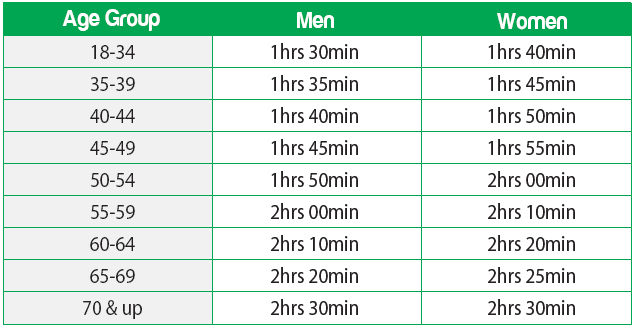 Male finishing the race within 1hour and 15 minutes and female finishing the race within 1 hour and 35 minutes will qualify and get an all-expense paid trip to Manila. 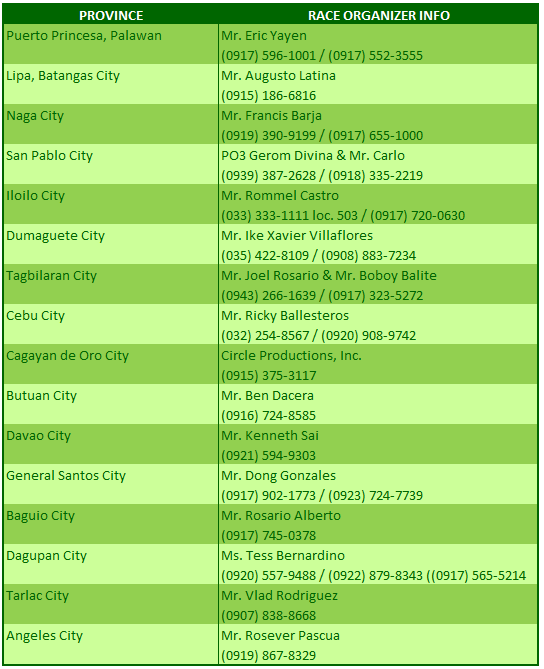 It is their responsibility to contact the race organizer on or before November 15, 2012 to coordinate their trip to Manila. 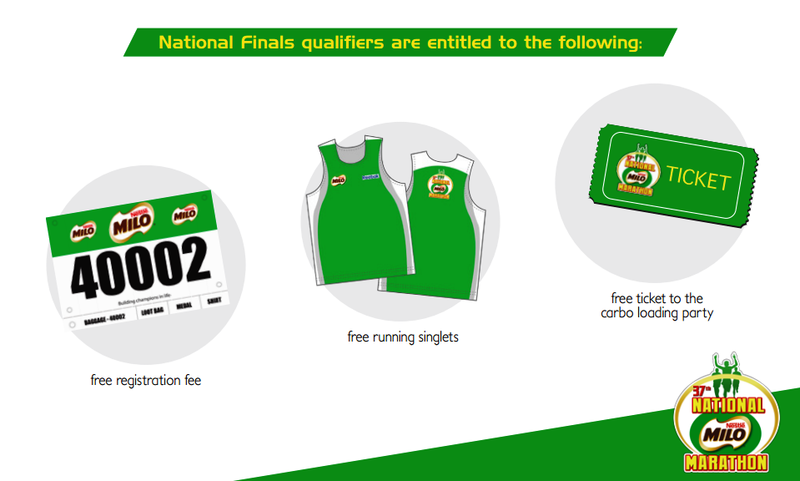 Those who will not compete in the National Finales forfeit their privileges. b. 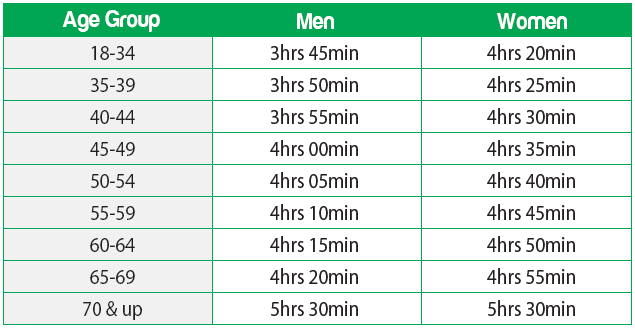 Runners finishing the race within the specified age-bracket and time below will qualify. All expenses related to their participation will be shouldered by the qualifier. Fastest Filipino 42.195K winners (male & female) will be dubbed as the 2013 MILO® Marathon King and Queen respectively and will be given the opportunity to compete in an international race outside the country. All expenses will be shouldered by MILO. Many underprivileged Filipino children run, play, and go to school with no shoes to cover their feet. How could they emerge as tomorrow’s champions, when at present, every little step they take is already a challenge? The plight of the shoeless children was what moved the MILO® Marathon to spearhead “Help Give Shoes” in 2010. The country’s biggest race tapped its huge participant base to support the cause. For every runner that signed up, a portion of the registration fee went to a fund. In the end, MILO® matched the total amount collected and purchased 4,200 brand new pairs of running shoes for indigent school children nationwide. 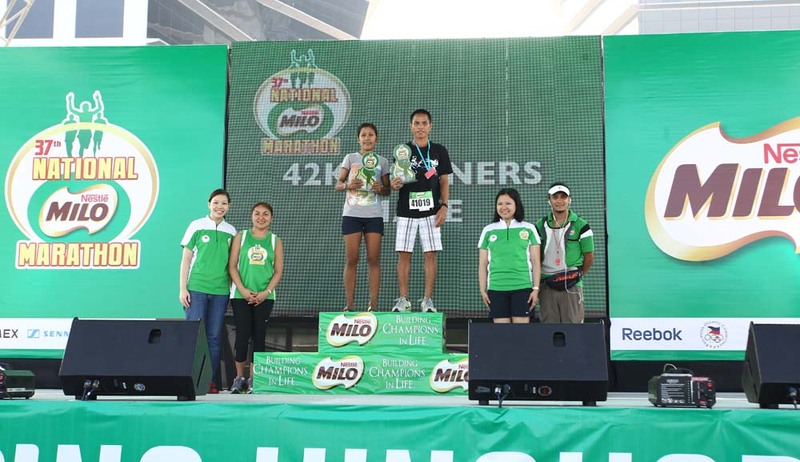 Last December, the 36th National MILO Marathon concluded an exhilarating season of Champions. 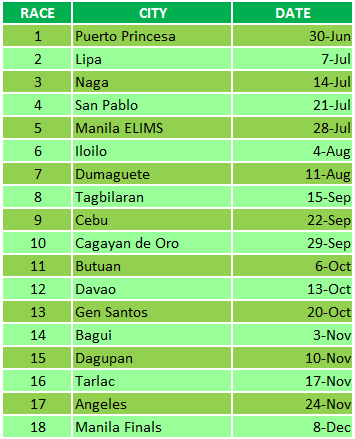 This year, MILO continues its legacy of providing quality races for runners, young and old, with 18 leg races across NCR, Luzon, Visayas and Mindanao. 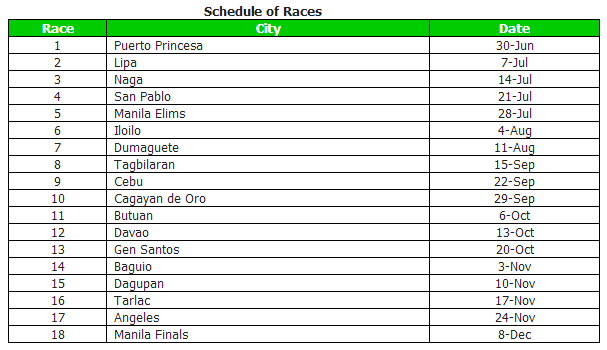 To welcome an exciting season ahead, here is the official race schedules for the 37th National MILO Marathon.